Are you a fan of snuggling up in a cozy sweater on a cool, crisp day? 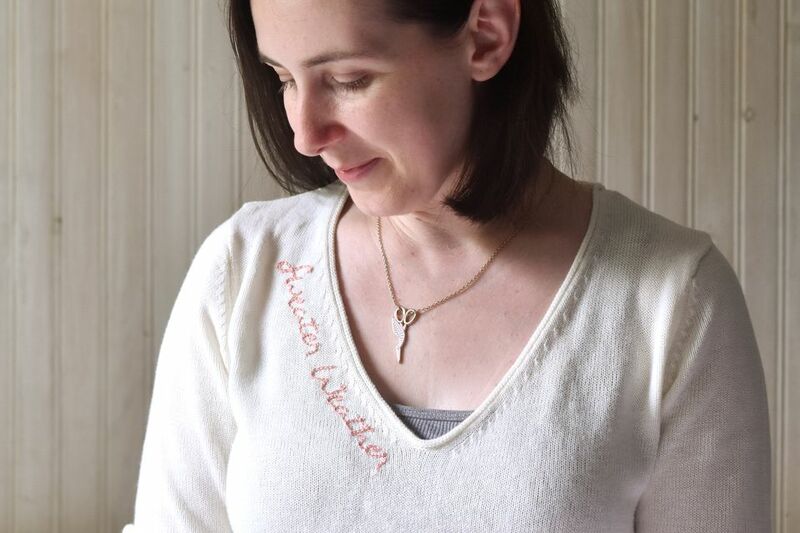 Embroider your love for sweater weather on the collar of your favorite pullover! A touch of hand stitching on a ready-made or handmade sweater makes it extra special. This free "sweater weather" pattern makes it easy to do that, and there are even a few versions to fit on different necklines! Because sweaters stretch, you need to stitch carefully and it's best to work without an embroidery hoop. But the process is simple when you use the tracing paper method for marking your pattern. Not only does the paper show you what to stitch, but it also acts as a stabilizer for your embroidery. Choose a trendy or favorite color to work with and get ready to update your fall wardrobe with stitching! Note: When choosing a sweater, look for a knit that is fairly smooth. Chunky knits do work, but they are more difficult to embroider on evenly. Download the Sweater Weather pattern. Print out the pattern and size it as desired. The pattern page includes three versions, each with a different curve. Hold the patterns up to the neckline of your sweater to see which works best. If you don't want to use the "sweater weather" phrase, you can write something in your own handwriting or print it out in a simple font. Trace the pattern on tracing paper with a regular pencil. Cut loosely around the design so there's at least 1/2" of extra space around the words. Use regular thread and long running stitches to baste the tracing paper pattern along the neckline of the sweater. Make sure that the pattern aligns with the neckline as you attach the paper. If it's crooked now, the embroidery will also be crooked. Start your embroidery with an away knot, which will hold the end of embroidery floss temporarily. A standard knot at the end of the thread will pull through the sweater and won't be secure. Embroider the design with your favorite basic stitch. The sample uses three strands and reverse chain stitch, but you can also use something as simple as back stitch. Tip: If you want to make some of the lines thicker than others, you can add a second line of stitching right next to the first, but it's best to do this after you remove the paper in the next step. When ending a thread and starting a new one, weave the ends in securely on the back of the previous stitches. After all the embroidery is done, carefully snip the away knot. Thread the end of the loose thread through your needle and weave it through the back of the completed stitches. To finish off your embroidered sweater, remove the basting stitches from the tracing paper. Next, begin carefully tearing away the paper. Try to tear along the edges of the stitching, but avoid tugging at the stitches too much. Sometimes the pieces of paper get stuck under the embroidery. You can use a needle and/or tweezers to gently remove the pieces. Your sweater is ready to wear, and just in time for the cool breezes of autumn and chilly days of winter!